This festive season, Four Seasons Hotel Kuala Lumpur will take diners on a culinary journey across Asia including flavors of Malaysia, curated by celebrity Chef Dato’ Fazley Yaakob with Executive Chef Junious Dickerson. 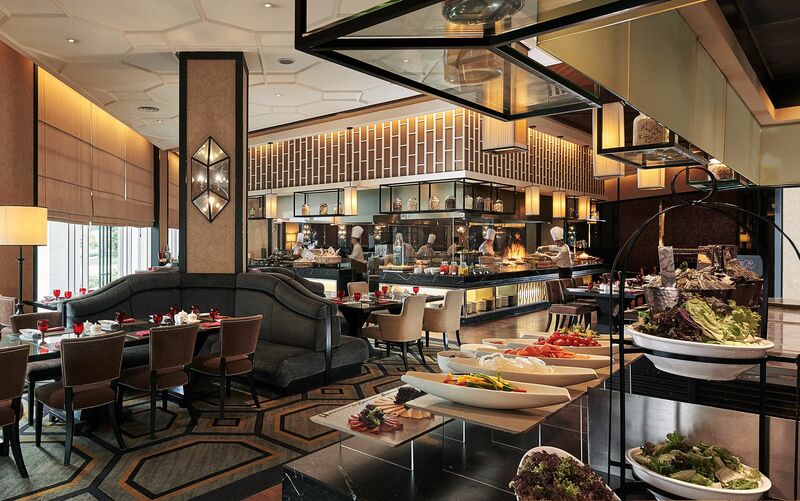 From 6 May to 4 June 2019, the chefs will take center-stage at the show kitchen of CurATE, Four Season’s Kuala Lumpur’s all-day dining restaurant. Chef Fazley, is a renowned Malaysian chef who graduated from the prestigious Le Cordon Bleu (Paris), and has been in the spotlight since he won MasterChef Celebrity Malaysia in 2012. 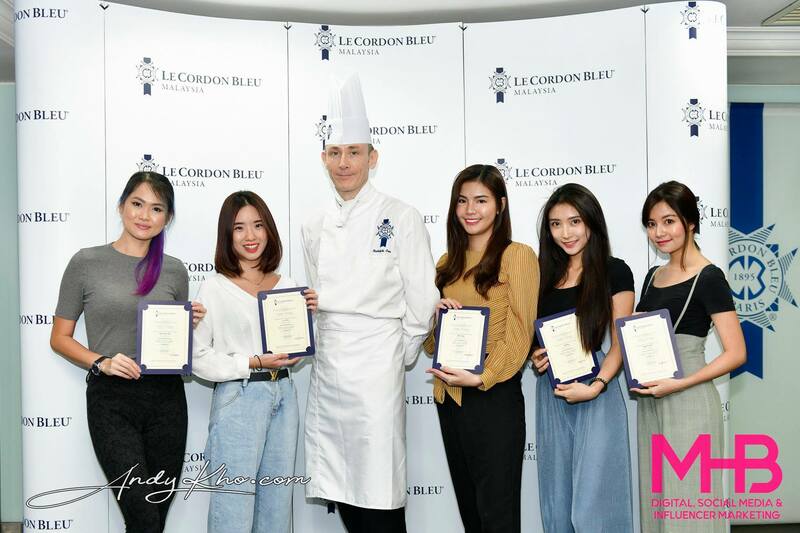 Not one to rest on his laurels, he went on to achieve numerous other milestones, including the Most Distinguished Le Cordon Bleu Alumni (Paris) and the Golden Chef Award at the Malaysia International Gastronomy Awards 2018. Chef Fazley’s signature menu promises guests a celebration to remember, bringing together flavors from Thailand, Indonesia, China, India and of course Malaysia, hosted in the bright, airy interiors of CurATE. “We are very excited to have Chef Dato’ Fazley Yaakob on board, and to introduce his secret recipes and distinctive cooking style to our guests. Since CurATE overlooks Kuala Lumpur’s impressive skyline, our feast will also offer some incredible sunset colors,” says General Manager Tom Roelens. For corporate groups or guests seeking a more exclusive setting, the hotel can also arrange a private and personalized celebration, combining the true essence of Sajian Nusantara with renowned Four Seasons hospitality. Chef Fazley’s signature menu will be available every evening from 6 to 12 May and 31 May to 4 June priced at MYR 178nett per person, and at MYR 208nett from 13 to 30 May 2019. Early bird discount of 20% is available for bookings made before 21 April 2019 with 50% deposits for 6 to 12 May and 31 May to 4 June 2019. This festive season, the St. Regis Kuala Lumpur transforms The Astor Room into a dining venue commemorating modern-Malaysian heritage during the special month of Ramadan from 10 May to 2 June 2019. This year, St. Regis Kuala Lumpur’s culinary team presents iconic dishes inspired by the peninsular states of Malaysia. 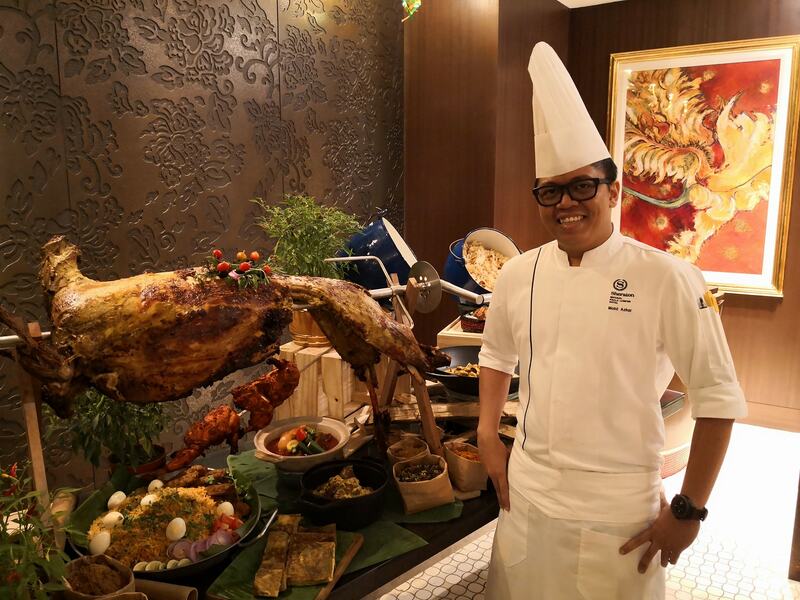 A must-try is Chef Mohd Ridzwan’s “Mambau” Smoked Lamb with Fresh Turmeric, Bird’s Eye Chili and Fresh Coconut Milk. Originating from Mambau, a small town in Seremban, Chef Ridzwan’s smoked lamb is a family recipe handed down through the generations where the meat and spices are simmered and cooked only in water with no oil added. His other signature dishes include, “Sri Menanti” Chicken Kalio, “Melaka” Spicy and Sour Red Mullet, “Batu Pahat” Basmati Moghul Gam Biryani and many more. The “Warisan Melayu” themed buffet dinner also highlights Chef de Cuisine, Norazizi bin Taslim’s most sought after dish at The St. Regis Kuala Lumpur, his “Slow-Roasted Grass Fed Australian Spring Lamb Marinated with Malay Spice” and served with a selection of pickle, mint sauce, mustard black pepper sauce and roasted coconut tamarind sauce. Embracing the essence of Malaysia’s multi-ethnic culture, there will also be an array of traditional and international dishes like the “Chicken Rendang”, “Beef Rendang” accompanied with “Lemang”, “Ketupat Palas with Beef and Chicken Serunding”, “Charcoal Fire Chicken”, “Beef Satay” accompanied with sweet and spicy traditional peanut dip, “Classic Malay Chicken Bubur Lambuk” and more. 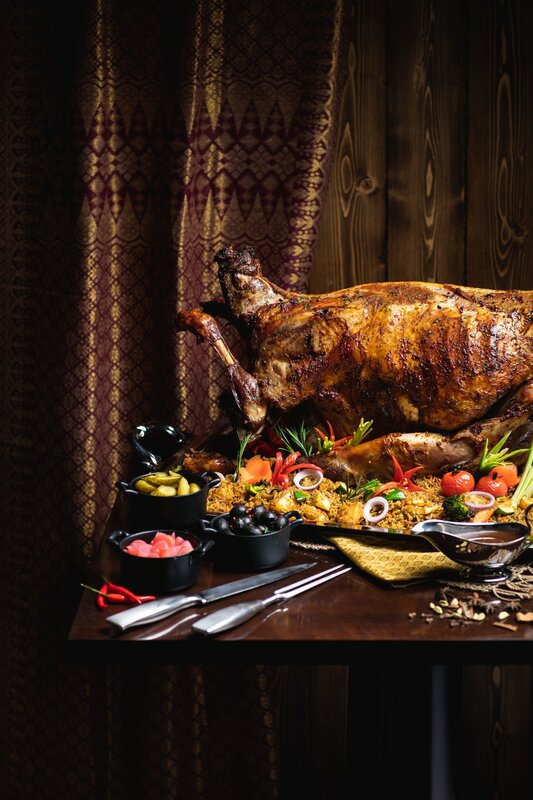 The Barakat & Syukur buffet dinner is available from 6:30 pm to 10:00 pm daily from 10 May to 2 June 2019, priced at MYR228+ per person, at The Astor Room, Lobby Level of The St. Regis Kuala Lumpur. 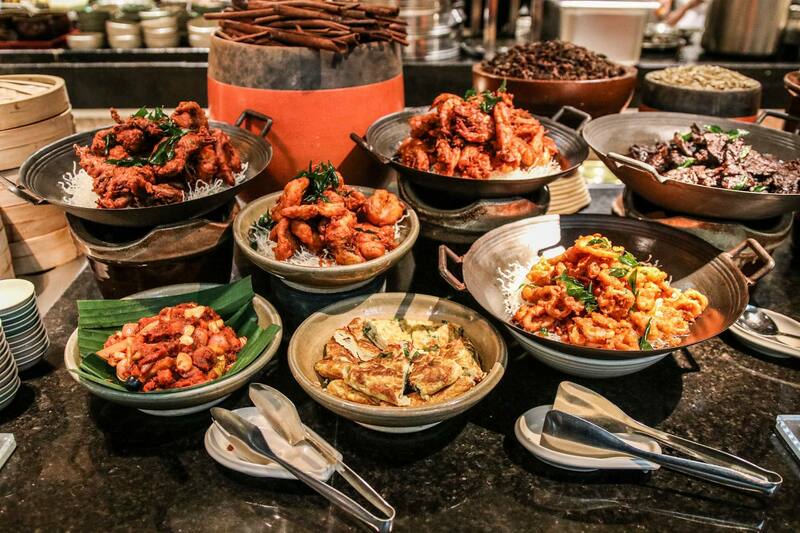 Starting from 6 May 2019, Grand Hyatt Kuala Lumpur will be having a Malaysian buffet entitled “Aneka Rasa” at JP Teres, with Malay, Indian and Chinese cuisines selection, as well as Malaysian visual arts from Sireh Pinang Colony. 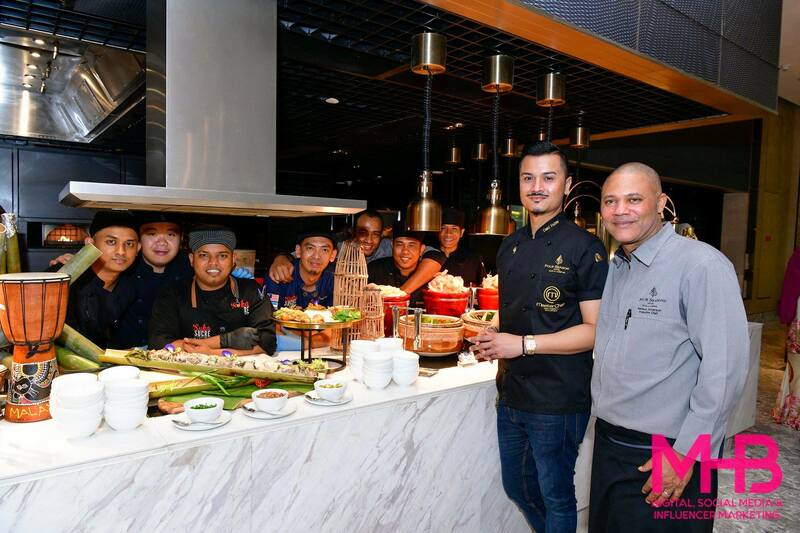 The buffet presents a complete local experience with over 150 dishes specially curated by Chef Nazib and Chef Sanjay who are keen on sharing their timeless family recipes by emphasizing the heritage of Malaysian flavours. With sustainability and authenticity in mind, the chefs made an effort to source all the ingredients carefully, prioritizing seasonal local produce in the menu. The extensive buffet set-up spreads from the indoor to the outdoor dining area of JP teres, featuring more than 20 live-cooking and buffet stations including slow-cooked Kambing Golek carving station, grill stations featuring assorted satays, tandoori station, Nasi Kandar station, Middle East specials, Chinese roasted duck pancake station, over 30 mouth-watering desserts and many more. On Friday and Saturday nights, the chefs will be firing up the grill for exclusive Barbecue Nights at the outdoor dining area of JP teres featuring a selection of meats and sustainable seafood. Sundays will see freshly prepared sustainable seafood on ice, with highlights that include assorted oysters, tiger prawns and crabs. *Minimum booking of 20 adults is required. *This pricing is only applicable for bookings confirmed and full pre-payment made by 20 May 2019. Full pre-payment is required to guarantee a booking and prices quoted are inclusive of 10% service charge and 6% Sales and Services Tax (SST). Organize iftar events at Grand Hyatt Kuala Lumpur throughout this fasting month and celebrate Hari Raya with open house events at the hotel’s thirteen (13) highly versatile events spaces equipped with the latest facilities. 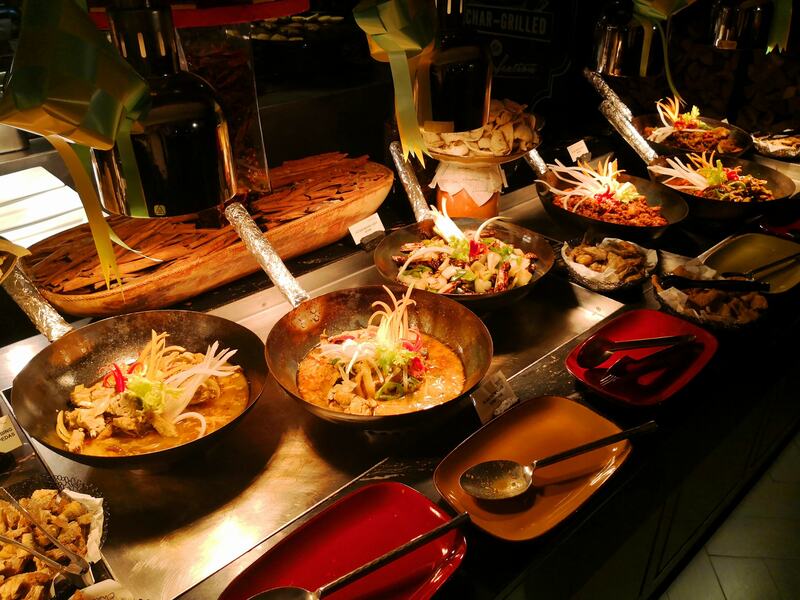 Choose from a wide selection of menus with over 50 authentic Malaysian dishes served in buffet style. For more information, call the hotel’s event specialists at +603 2182 1234 or email kuagh.rfp@hyatt.com (a minimum booking of 50 persons is required). This festive season, the culinary team at Shangri-la Kuala Lumpur’s Lemon Garden has curated a buffet menu which infuses rich Malaysian flavours to its wide spread of specialities. The dinner buffet will feature the best of authentic Malaysian and international cuisine at Lemon Garden, Shangri-La Hotel, Kuala Lumpur between 7pm to 10.30pm from 5 May to 4 June 2018. The festive dinner buffet will have a live action corner with a barbeque pit at the terrace serving an array of sumptuous delights such as Shish Tawouk (Charcoal Grilled Chicken Cubes), Iranian Kubbiedeh (Charcoal Grill Minced Lamb), Iranian Tikka Mastih (Charcoal Grilled Beef), Barbecued Chicken Wings, Fresh Water Prawns Siamese style, Grilled US Oysters and more. 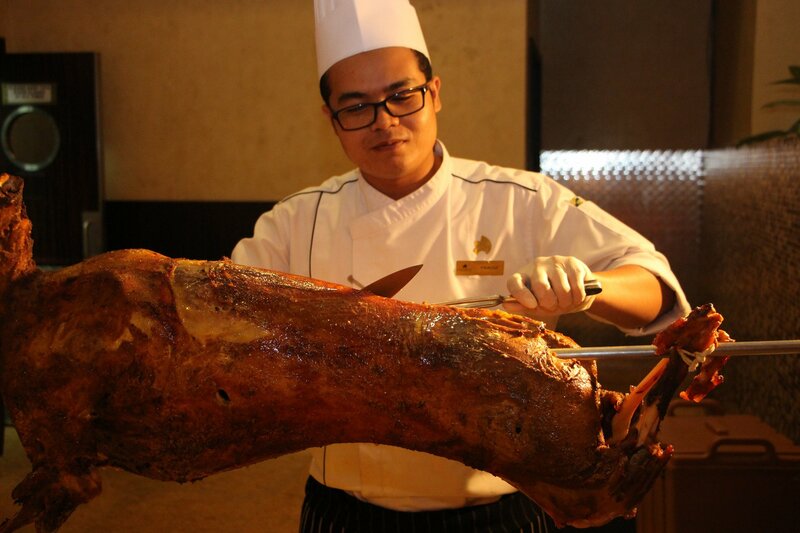 The Carving Corner will feature succulent Roasted Whole Lamb cooked to perfection with herbs and spices. There will also be a night market stall serving ‘Lemang Pulut’, ‘Lemang Pulut Hitam’, ‘Ketupat Palas’, ‘Serunding Ayam, Daging and Ikan’. An assortment of fresh seafood such as Steamed Tiger Prawns, Green Lips Mussels, Yabbies and Baby Scallops will also be served at the Seafood Station. The Malay theatre kitchen will feature flavourful main dishes such as ‘Sambal Udang’ (Spicy Sambal Prawn), ‘Rendang Pipi Lembu’ (Braised Beef Cheek with Malay Herbs and Dried Coconut Paste), ‘Ikan Besar Bakar Sos 3 Rasa’ (Baked Whole Fish with Hot, Sweet and Sour Sauce), ‘Kepak Ayam Madu Panggang’ (Grill Honey Marinated Chicken Wing), ‘Nasi Beriyani Kambing’ (Lamb Biryani), Roast Whole Lamb with Shangri-La Special Marination and more. 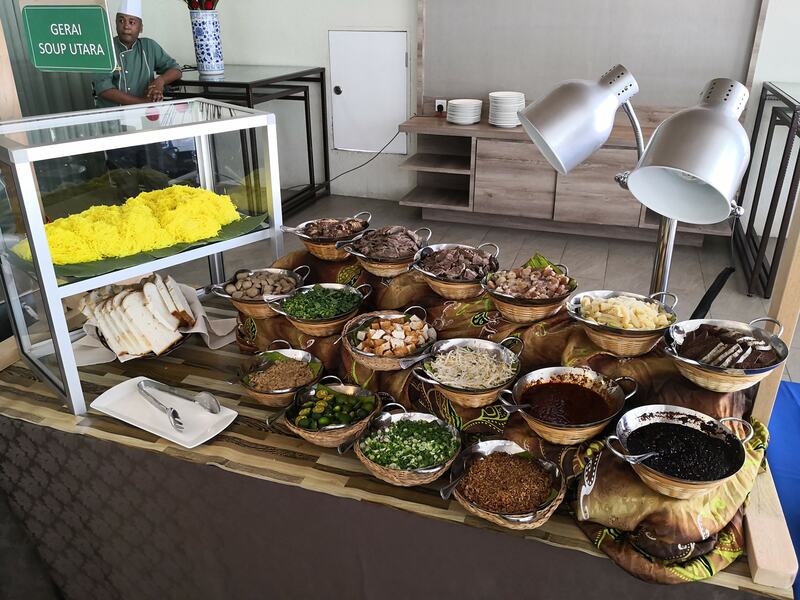 The cold appetisers on the buffet menu include ‘Jerim Sambal’, ‘Kerabu Taugeh dengan Ikan Masin’, ‘Ikan Masin Bercili’, and more. The Dessert Pavilion will be featuring an array of desserts such as ‘Ice Kacang with Condiments’, Deep Fried Cempedak, Apam Balik, Durian Cake, Pandan Cakes, Sekaya Cakes, Tropical Tiramisu, Coconut Raisin Tarts and more. The Shangri-La Group invites its diners to join them in giving to the less fortunate and to do their part to address food waste and world hunger. 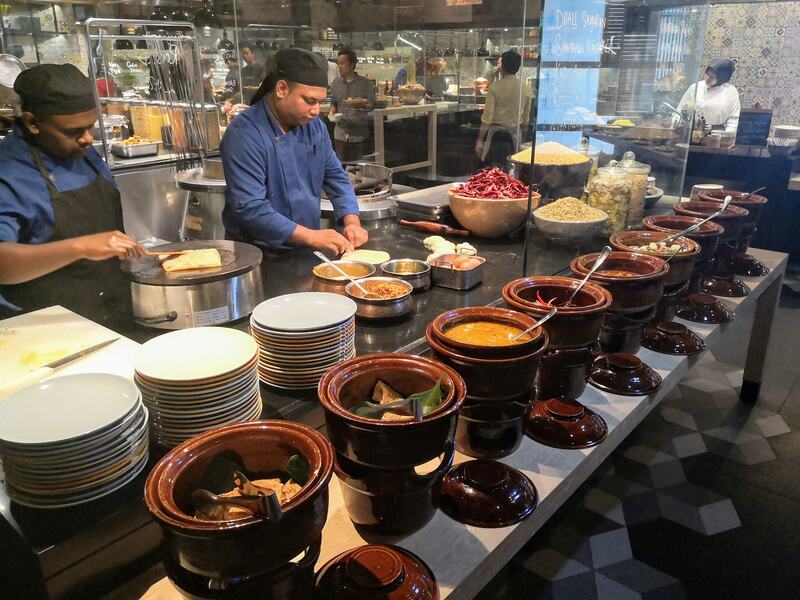 From 5 May to 4 June 2019, every buffet meal cover generated at the 15 participating hotels across eight countries in Southeast Asia and Middle East, India & Indian Ocean regions will see the Shangri-La Group donating part of the meal proceeds to feed people in need. Each country will be working with a beneficiary to aid in their efforts to address food waste and world hunger. Hunger is one of the big global issues today yet a third of the food produced in the world for human consumption every year (approximately 1.3 billion tonnes) is lost or wasted. Shangri-La Group’s five participating hotels in Malaysia will be supporting The Lost Food Project, one of Malaysia’s food bank pioneers that rescues quality, nutritious surplus food that would otherwise end up in landfill, and redistributes this food to those who need it most. According to Solid Waste Corporation Management (SWCorp Malaysia), a government agency dealing with solid waste, Malaysians generate 16,687.5 tonnes of food waste daily – enough to fill the 88-storey Petronas Twin Towers to the brim in just 18 days if the food waste goes into landfills. The Lost Food Project currently rescues an average of 10 tonnes of food per week from going into landfill and redistributes the food to those in need, including 33,000 residents living in low cost flats and other charities. Every cover sold at participating Shangri-La Malaysia restaurants will help The Lost Food Project feed an additional 20 people. Early Bird Offer is now available for dining period from 5 till 14 May (except 10 & 11 May) at RM 180 nett per person and is only valid from Sunday to Thursday. The Festive Dinner Buffet is priced at RM 203 nett per person from Sunday to Thursday and the Festive Seafood Dinner Buffet is priced at RM 236 nett per person from Friday to Saturday. 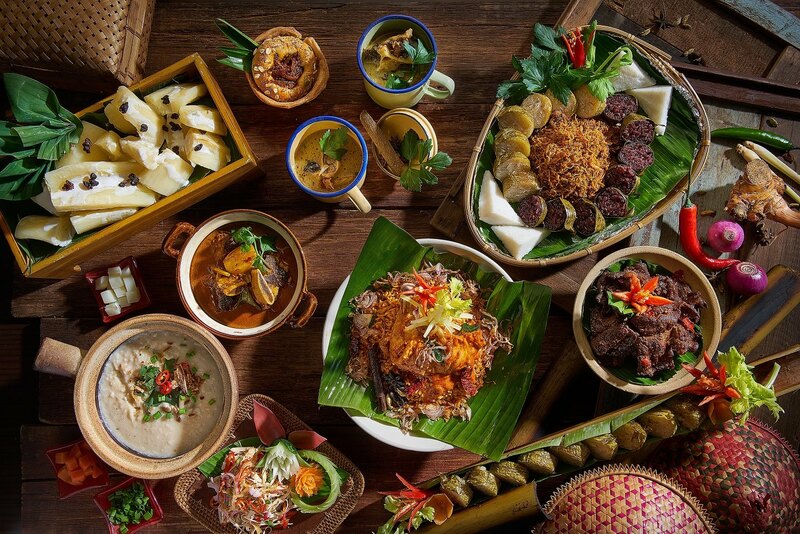 This Ramadan, Sheraton Imperial Kuala Lumpur will be preparing a gastronomic feast entitled “Selera Kampung at Essence”. Sheraton Imperial Kuala Lumpur recently relaunched following a multi-million Ringgit transformation. The entire hotel now features a new look with grandeur space that recreates a refined hospitality while incorporating simplicity in style. 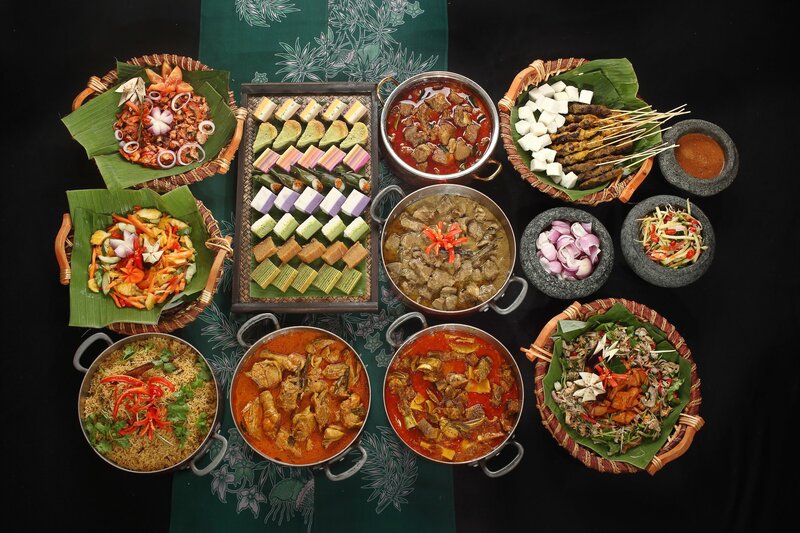 The “Selera Kampung at Essence” buffet will feature an array of signature delicacies such as Kerabu Pucuk Paku (Fiddlehead Fern Salad), Asam Pedas Ikan Pari (Fish in Asam Curry), Ikan Bakar with Sambal Belacan and their Ramadan Signature, Gulai Kawah Rusuk Lembu (Beef Rib Stew), along with other authentic and traditional Malay dishes as well as a touch of international favourites. I really enjoyed the bubur lambuk which was silky smooth and very flavourful from all the herbs and spices! The sup gearbox was also another flavourful option, while the tapai pulut which provides a lovely end to the meal. The buffet is available from 6 May to 1 June 2019, priced at RM148.00 nett per person. Enjoy the Early Bird promotion of 25% off when you make bookings from now till 30 April 2019. On top of that, for every 12 adults booked, the 13th adult dine for free. Discount for group bookings of more than 10 persons and selective participating banks are available upon request. 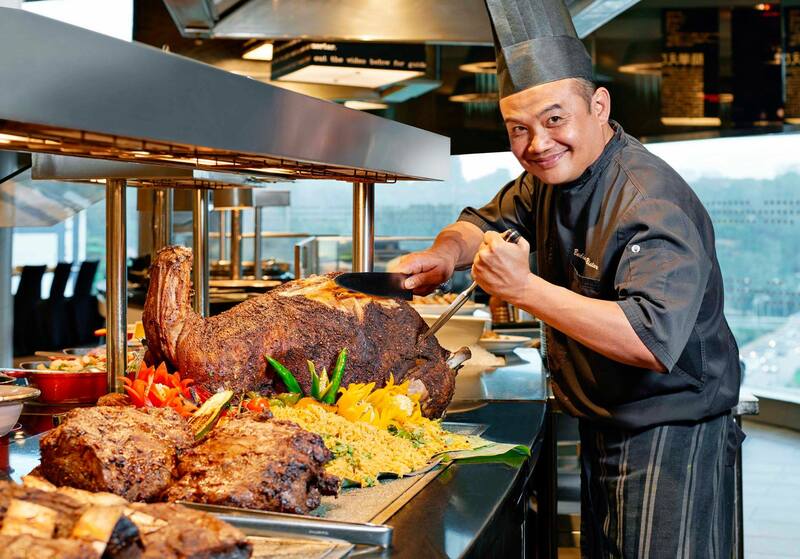 Latest Recipe at Le Meridien Kuala Lumpur will be having a seasonal buffet this Ramadan period with the theme ‘Citarasa Harmoni’ featuring a buffet spread specially curated by Chef Budiman and his team of culinary experts. 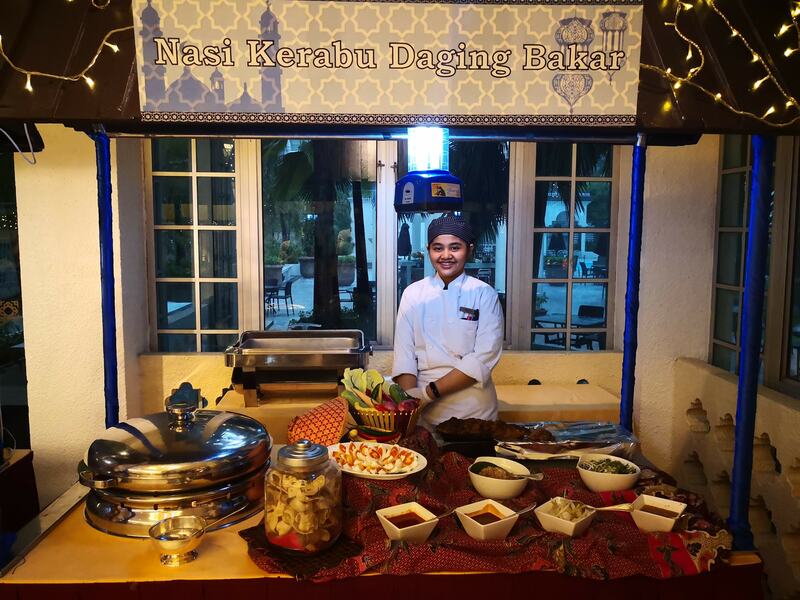 The Malay appetiser station will feature a variety of Malay appetisers such as pecal desa, tauhu sumbat, acar limau, popiah basah, and nasi ulam. Also available will be different varieties of kerabu dishes such as, kerabu satay ayam served with cucumber and red onions, kerabu nyonya hidupan laut served with sambal kelapa tumbuk, kerabu ikan salai served with ulaman desa, kerabu perut bakar racik served with sambal kelapa, and kerabu pucuk ubi served with daging racik and cabai merah. A nice warm and flavourful soup after a day of fasting is always a welcome sight and the selection at Latest Recipe includes favourites such as oxtail, vegetable, potato or bukhari soup. There will also be traditional must-haves such as Bubur Lambok, a traditional Malay porridge. Chef Budiman adds a little twist of his traditional recipes into the variation of Malay main dishes which includes a selection of main dishes featuring berbiri panggang with rempah al kausar, and sos barak, ayam kalio with potatoes, udang galah with tempoyak and lemak cili kampong and, daging pesamah utara with rebung and kerisik, ikan tongkol berlado hijau. Chef also recommends that diners try the tender rendang kambing, accompanied with wok-fried vegetables and steamed white rice. There will be live cooking stations, with live goreng-goreng action where the chefs will serve some freshly fried Malay delicacies such as aneka pisang, nangka, keledek, keladi, sukun, cempedak, keropok lekor with sos pedas. Other local specialties include the soup noodles, laksa Sarawak, mee kari, and sup herba accompanied by a variation of condiments and toppings to choose from. Adding variety to the buffet will be the Indian, Chinese, Japanese and Western stations. For Indian cuisine, look out for the lamb tandoori, roti naan, dhal curry and other vegetarian and non vegetarian options. At the Chinese station, there will be an array of dim sum selections such as chicken char siew pau, har kow, black pepper siew mai, carrot siew mai, and lo ma kai. Over at the Japanese counter, expect Japanese delights from sashimi and sushi accompanied with side condiments, selections of teppanyanki and live tempura counter. The Western counter will be serving rotational carvings in addition to the pasta station where diners could request pastas cooked according to their preference. For sweet tooths, there’s the assorted kuih-muih which includes kuih tepung talam, kuih apam balik, fresh dates, lompang warna warni, kuih ketayap, kuih cara manis, kuih tepung pelita, and kuih wajik. Cool down with the ABC and Cendol with side condiments and a selection of soft serve ice cream, plain or fruity yoghurt. This ‘Citarasa Harmoni’ buffet dinner will be available at Latest Recipe from 6 May to 4 June 2019, and priced at RM 180 nett per adult and RM 90 nett per child. Early bird vouchers are available now at RM 128 nett per adult and RM 64 nett per child, on a first-come, first-served basis. For members of Marriott Bonvoy, enjoy 10% discount off the early bird pricing. Hotel Istana Kuala Lumpur City Centre’s Executive Chef, Al Fitri Al Bakri and his culinary team will be featuring a delectable Ramadan halal buffet spread of over 100 dishes, which will show-case the best of authentic local dishes and flavours. Start with a delicious variety of Kerabu – Kerabu Kacang Botol Udang Kering, Kerabu Daging Tomato and Kerabu Ayam Pegaga, and more. Then try some of Hotel Istana’s signatures dishes such as the Salmon Fish Head Curry, Malaysian Satay and Hot Claypot BBQ Chicken Rice. 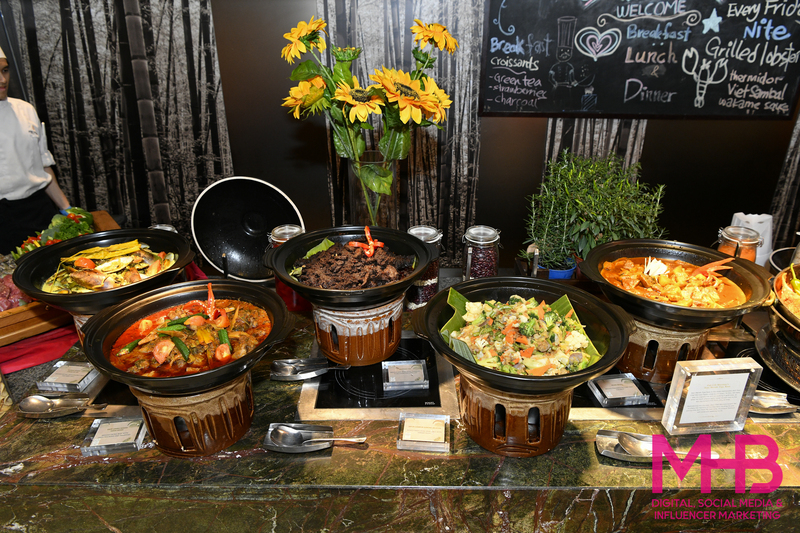 At the Chefs’ Live Action Stations, look out for local favourites such as Chay Kuey Teow, Lemang and its condiments and the Carvery Station (Whole Roasted Balinese Marinated Lamb served with a selection of Vegetables with Mustard, Black Pepper, Mushroom and Rosemary Sauce) and the list goes on. The Chefs have also added signatures dishes from various states in Malaysia and countries such as Pakistani Briyani, Murtabak Singapore, Vietnamese Spring Roll, among others. In addition to an authentic Malay fare, patrons can also choose from a selection of Indian, Western, Chinese and Fusion cuisines. Hotel Istana is also presenting various durian delights in the form of Glutionous Rice with Serawa Durian, Dodol Durian, Cendol Durian, ABCD – Air Batu Campur with Durian and Durian Crepes. End the great culinary journey with sweet selections that include Malay Kuih such as Keria, Onde-Onde, Cucur Badak, Bingka Ubi, Tepung Talam, Kuih Lapis or if you fancy a healthy dessert, seasonal local fruits will be on the buffet counter. If you are looking for something more Western – there is the Bread and Butter Pudding, Apple/Blueberry Crumble, Tiramisu, Chocolate Brownies, Cream Brulee. The hotel can also arrange group and private buka puasa gatherings in the function rooms. In addition to the buffet, there will be a designated prayer room, prayer mats and sandals during Ramadan. The “Santapan Selera Ramadan” Buffet at Taman Sari Brasserie in Hotel Istana Kuala Lumpur is priced at RM158.00 nett per adult, and is available from 8 May to 4 June 2019. Early Bird Special Vouchers are priced at RM120 nett per adult, and can be used throughout Ramadan month. Reservation is required. There will be a 15% discount for selected credit cards from 8 May until 4 June 2018 (terms and conditions apply). There will also be a Raya Buffet Hi-Tea on 5 and 6 June 2018 from 12.30 pm to 4.30 pm for only RM98 nett per adult. InterContinental Kuala Lumpur invites diners to celebrate the different palates with a truly Malaysian feast at Serena Brasserie. Themed “Warisan Tradisi di Serena” (Traditional Dishes in Serena), the culinary team have combined their treasured family recipes and expertise to present a spread of childhood favourites that takes diners on a journey down memory lane with classics such as Roti Canai, Ice Cream Potong, Tau Foo Fa, Murtabak and many more this holy month. A dish close to his heart and one that is prepared with love, Chef Mortaza’s three flavoured Red Snapper infuses sweet, sour and spicy tastes for a deliciously tangy dish. Paired with fresh ingredients including tomatoes, pineapples and capsicum, the fried fish dish strikes a nostalgic note to his childhood days where many memories were made with this family favourite dish. Beginning his culinary journey in a local restaurant the first dish Chef Wong mastered was Stir-Fried Tiger Prawn with Butter Sauce and Egg Floss. Not an easy feat, the egg yolks are carefully stirred into hot oil until they turn golden brown, all while ensuring they do not burn. This dish is perfect combination of fresh Tiger Prawns and savoury yet sweetness of the butter sauce. Kibas Bakar, lamb that is slow roasted over charcoal, was a staple in Chef Yusof’s village. Savoured for special occasions Kibas Bakar continues to be a much-loved dish as its succulent meat and crisp skin is a treat during the festivities. Marinated overnight with aromatic spices, Chef Yusof’s special marinade is continuously basted over the lamb to ensure every bite tantalises the taste buds. A true local favourite and definitely a staple for some, Chef Roy’s first dish was the popular toasted flatbread – Roti Canai. His variation features an unconventional shot of Sprite in the dough to provide that enjoyable golden-brown crispiness. A local favourite and found at various open stalls, Roti Canai is often coupled with various curries or Dhal, whereas Murtabak is the same Roti Canai dough, except stuffed with savoury mix of eggs, meat, onions and spices. 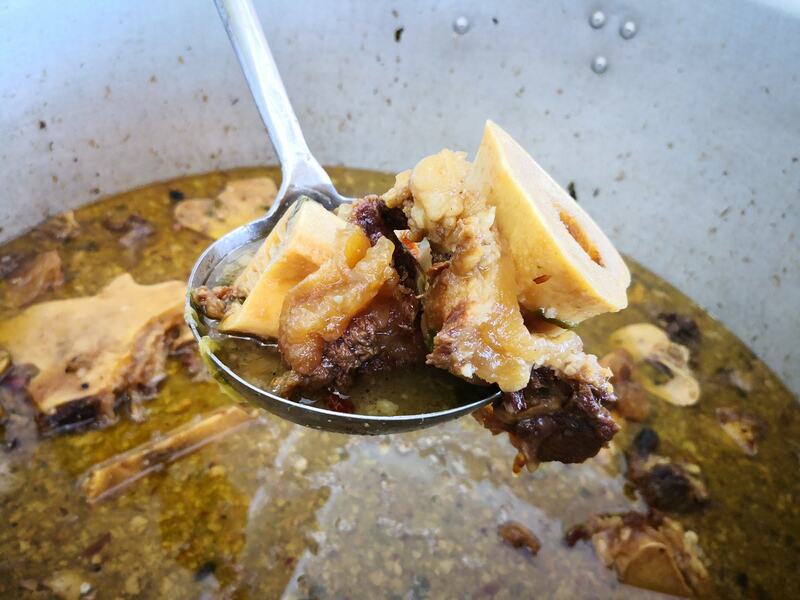 A Malay version of Lamb Shank soup, Chef Fakrul learnt to cook this rich and hearty soup from his mother. Boiled over low heat with cinnamon, star anise, and other Malay herbs, he includes a secret ingredient to elevate the flavour, as taught by his mother. The meat is then slow-cooked to ensure a tender, fall-off-the-bone texture that melts in your mouth as you savour this delicacy. Ice Cream Potong is one of Chef Chan’s favourite dessert, according to him, he and his mother enjoy dessert very much. He still remember when he was younger, they will visit the night market during the weekends and they will have Ice Cream Potong together. In the olden days, Ice Cream Potong came in large blocks and was cut into small shapes and served in a slice of bread. Chef Chan’s favourite is red bean whilst his mother loves sweet corn. A soft tofu that is submerged into a sweet syrup, this local favourite dessert resonates with many Malaysian childhoods, including Chef Sze Wei who used to help her grandmother to sell her popular Tau Foo Fah at the market. Tender, silky and smooth, Chef Sze Wei adds ginger syrup to enhance the taste of the ordinary palm sugar, making it the perfect treat to cool of your body during the hot weather. Rojak, which means mixture, is commonly a teatime dish that mixes different fruits with a tangy, peanut sauce. Chef Amin’s Rojak principle is simple – a good Rojak sauce consists of prawn paste, sugar, roasted peanuts and chilli paste, while an additional sprinkle of freshly roasted peanuts is the final touch to ensure a tasty Rojak. Meanwhile, the buffet will also feature an array of Malay appetizers, and fresh seafood such as slipper lobster, oysters, scallops and mussels. Over in the Indian corner, look out for the Chicken Tandoori, Lamb Biryani, Fish Head Curry, Aloo Ghobi and Jinga Korma Prawn. Fans of Oriental cuisine can look forward to Wok-Fried Crab with Kam Heong Sauce, Kung Poh Chicken and many more! The extensive spread also spans eight action stations with à la minute specials prepared on the spot including Roti John, Shawarma, Tandoori, Rojak, and Kibas Bakaer. Other stations include the grilled station, featuring seafood, Lamb Shoulder and Beef Steak, a deep-fried station and a dessert station serving Ice Cream Potong, Cendol and Ice Kacang. For dessert, there well be Western-style desserts such as a chocolate fountain, and assorted cakes, as well as local Malay pastries such as Kuih Talam, Onde-Onde, Kuih Lapis and Malay Cookies. Warisan Tradisi di Serena Buffet will be available from 6 May to 4 June 2019, priced at RM 188 (Adult) and RM 69 (Child) for weekdays, and RM 158 (Adult) and RM 55 (Child) for weekends. Inspired by the season’s true spirit of giving and sharing, the hotel’s signature Tao Chinese Cuisine restaurant will be offering a sharing-style menu for diners who want a non-traditional experience to break fast with family and friends, while Tatsu Japanese restaurant will be offering a Bento Selera priced at RM 110 per set from 6 May till 4 June 2019. Catch up on nostalgic Raya memories over a delightful High Tea Buffet featuring authentic Malay delicacies on 5 and 6 June 2019, priced at RM 108 per person, from 12.00noon till 3.00pm. A special offer of 30% will be given to guests who dine from 6 to 10 May 2019 in Serena. Gourmet Collection members are rewarded a 25% discount while IHG Rewards Club Members, In-House Guests, CIMB, Citi Bank, UOB Bank and HSBC Bank card holders are entitled for a 20% discount. For added convenience, a spacious prayer room complete with mihrab is located on Level 5 of the hotel. A banquet package is available for a minimum of 200 persons, with a complimentary whole lamb included in the package priced at RM165 nett per person. The package also includes complimentary standard Raya-themed decoration and the use of standard AV equipment. Contango has two open kitchens which will be dishing out a variety of cuisines including Japanese, Thai, Western, Italian and a special emphasis on Malay cuisine this festive season. This seasonal buffet is available from 3 May to 6 June 2019, priced at RM150 nett per pax. Over at Majestic Hotel’s functions rooms on Level 3, diners get to partake of over a hundred classic Malay recipes from around Malaysia, specially prepared by Chef Zaidi and his team. Look out for specialties such as the Sambal Udang Galah, Rendang Kambing, and Ketam Lemak Cili Padi. This festive offering is priced at RM125 nett per pax, and is available from 11 May to 2 June 2019. Traders Hotel Kuala Lumpur brings authentic kampung fare at Gobo Chit Chat – providing the perfect meal away from your “Kampung”. The hotel’s chefs and the culinary team have carefully put together a special menu for the Selera Kampung buffet featuring tempting local delights and international cuisine. The Gobo Chit Chat team and chefs will combine elements from different cultures in the buffet spread. By preparing a spectacular array of more than 160 dishes, from Chicken Murtabak, Bubur Lambuk Kambing, Ikan Patin Tempoyak, and Roti Canai, to the signature traditional Malay dessert Pengat Durian. As with the restaurant’s tradition, there will be endless supply of New Zealand ice-cream for dessert. This year, there will be an additional special station – ‘Durians for dessert’ with various types of durians for diners to enjoy. 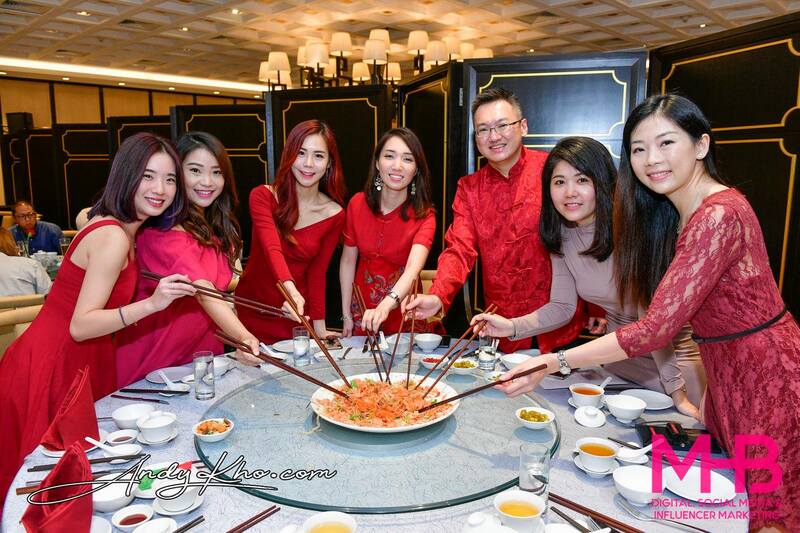 There is also an exclusive 5+1 offer, whereby for every group of six persons and one dines for free. The Selera Kampung early bird vouchers is available for purchase from now to 30 April 2019., priced at RM 99 nett per person and is valid throughout the month of Ramadhan. Early bird voucher holders are not entitled for Durian for Dessert. This Ramadan, Impiana KLCC Hotel promises a memorable “berbuka puasa” experience with the Selera Serantau Ramadan Buffet Dinner featuring more than 200 specially prepared traditional local favourites, to be savoured with the soothing sounds of a live traditional ghazal performance in the background. Upon breaking fast with refreshing ZamZam water, tuck into a delectable and generous buffet spread featuring the best of Malaysian cuisine, prepared using the finest halal ingredients. Highlights of buffet spread are the chef’s signature dishes Sup Gearbox Meletup!, Kari Kepala Ikan Selatan, Nasi Briyani Gam Kambing Istimewa, and unlimited servings of durian and Baskin Robbins ice cream. The feast is a fusion of flavours and cooking styles, and diners will indeed be spoilt for choice. The room rates quoted are inclusive of breakfast for one (1) person. Club Deluxe and Club Premier Room guests will enjoy access to the Hotel’s Club Lounge which serves daily breakfast, afternoon tea, evening cocktails with canapés, coffee, tea and non-alcoholic beverages. For business needs, complimentary unlimited internet service and use of the Club Lounge discussion room is available for up to two hours daily by reservation. 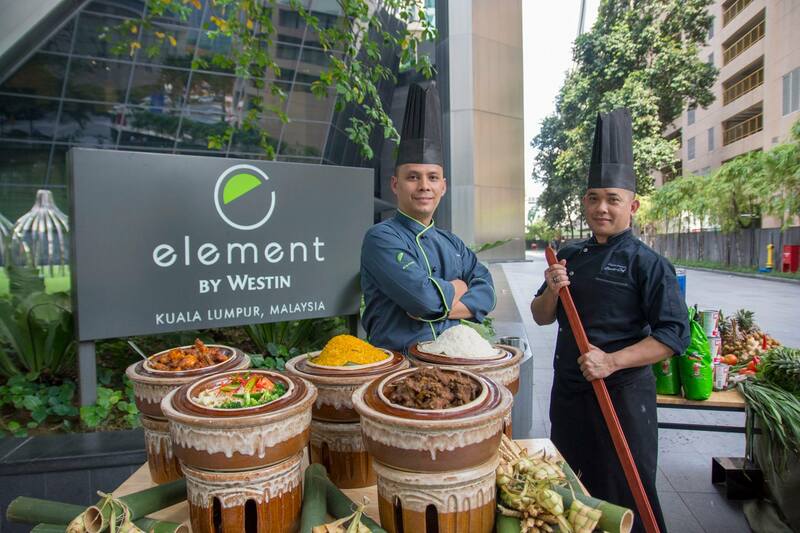 Element Kuala Lumpur welcomes Ramadan 2019 with the ‘Ayahku Tukang Masak’ buffet at TRACE restaurant which is located on the 40th floor of the hotel. Executive Chef Man and his culinary team brings that keluarga kampung nostalgia with a spread of popular classic dishes. Break fast in the sky with refreshing greens and local salads such as Fresh Papaya Salad, Smoked Meat Salad, Chicken with Mushroom Salad (Kerabu Betik Muda, Kerabu Daging Salad, Kerabu Ayam Cendawan) while soaking in the magnificent city view of Kuala Lumpur. A must-try from the menu includes Asam Laksa from the noodle station, a hot and sour soup with rice noodles made with fish stock and local herbs, guaranteed to be lip smacking delicious. Not to forget the chef’s selection of Ayam Masak Ross, Rendang Daging Minang, Udang Goreng Jintan Berempah and Ikan Masin Masak Lemak Pisang. 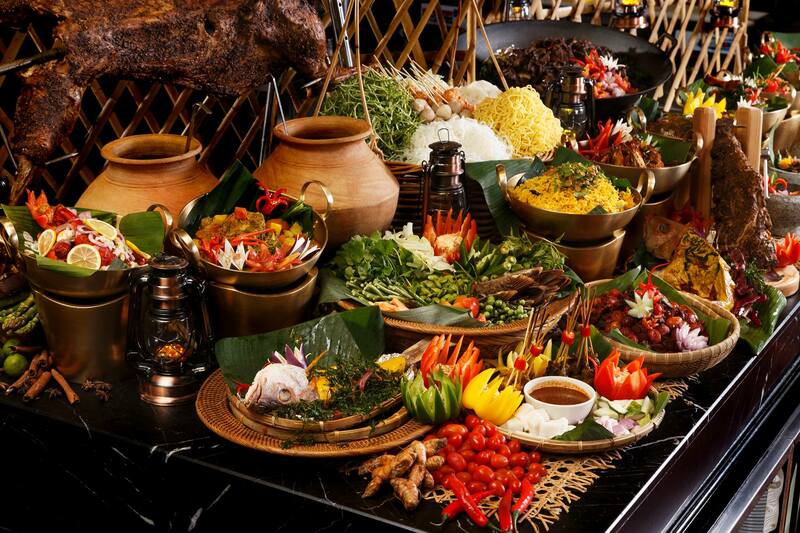 Indulge in roasted chicken, duck and lamb, also not forgetting Chef’s lemang and ketupat. ‘Ayahku Tukang Masak’ displays the highlight for this year, at the “Bapa KU” grill station. Sample a variety of grilled meat selection from premium sirloin steak, lamb chops, chicken escallops, and seafood arrays to meat sausages, dressed in special homemade condiments. Look out for the Barbecue Beef Brisket with roasted vegetable and grilled pineapples, which is sliced and served from a mobile trolley. Diners can round up the culinary journey at the sweet corner and be spoilt for choice by the vast variety of desserts. The dessert corner features a range of popular Malay kuih-muih as well as cheese cake, red velvet cake, strawberry lychee mousse, crème burlee and plenty more. Not to be missed is the warm Serawa Durian with Arabic bread. These dishes will vary each day throughout the whole month to ensure diners enjoy a variety of offerings. At the end of the buffet, diners can bring home a package of meat spices prepared to perfection as a bespoke giveaway to replicate Chef’s signature dishes at home. 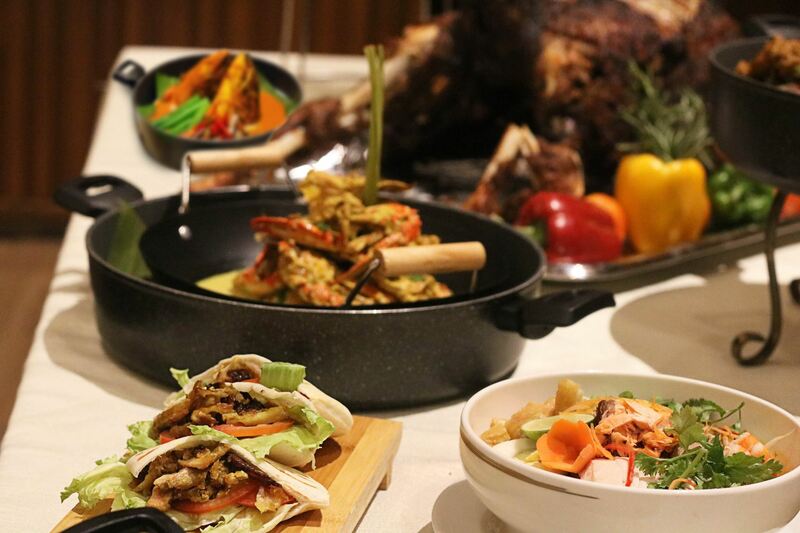 Priced at RM 148.00 nett per adult & RM 74.00 nett per child, the Ayahku Tukang Masak Buffet promotion will be available from 6.00pm to 10.30pm at TRACE restaurant and bar, from 7th May – 2nd June 2019. Early bird offer is priced at RM 98.00 nett per person from 15th March – 1st May 2019. The Boulevard St. Giles Hotel will be offering their annual Iftar menu this coming fasting month of May. With the theme of “Bazaria Buffet Dinner – Experience Alfresco Dining by the poolside”, it will offer diners an open air iftar experience under the sky by the poolside with BBQ setup, and more than 10 hawker stalls featuring an array of traditional Malay dishes. The hotel recommends the traditional Ulam, Kerabu and Rojak (Rojak Buah, Rojak Pasembur, Sotong Kangkung, Rojak Petis and Gado-Gado) to excite those taste buds. Savour generous servings of Nasi Briyani or Nasi Goreng Petai coupled with Ayam Rendang Pucuk Ubi (Tapioca Leaf Rendang Chicken), Ekor Asam Pedas (Spicy & Sour Oxtail), Sambal Petai Prawn, Ikan Patin Masak Tempoyak, Terung Berlada (Peppered Eggplant) and Paru Berlado. The grill station will be featuring Ayam Percik (Coconut Spiced Chicken), roast lamb, honey-coated chicken wings ala Sarawak, and an assortment of grilled fish. There will also be other stalls such as the Char Koay Teow stall, aneka bubur stall serving bubur ashura, bubur lambuk, bubur pulut hitam, and traditional Goreng-Gorengan stall by Cik Ton serving Pisang Goreng, Cempedak Goreng, Sukun, Keledek Goreng and Cucur Udang. The dessert section will feature Durian Cendol & Ice Kacang, an array of local puddings, kuih-muih, ais kacang, tapai ubi and tapai pulut. The Bazaria Buffet Dinner will be held at the Wild Rice Restaurant, located on Level 9 of the hotel, priced at RM98+ per adult and RM48+ per child (6-12 years old). 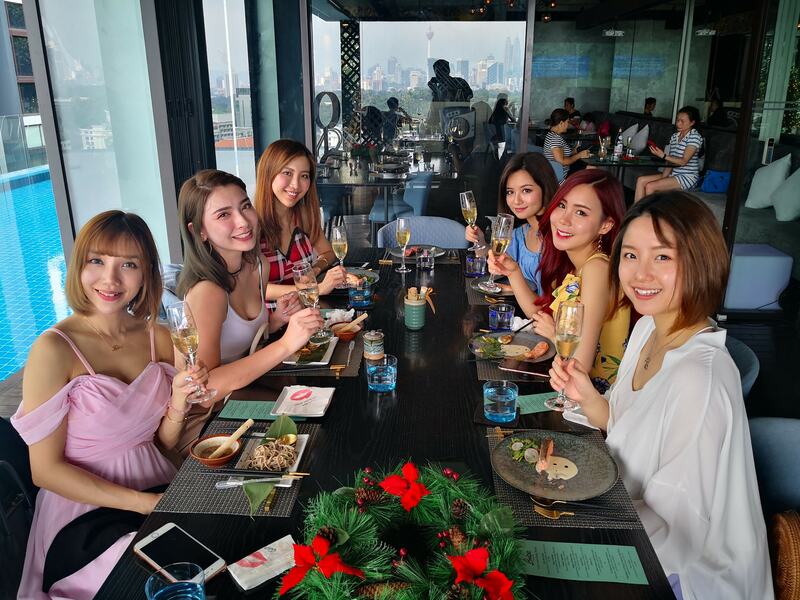 The restaurant is helmed by Chef Sheng, one of Malaysia’s most decorated chefs with over a decade of culinary experience in both traditional and high-end cuisines. With multiple awards under his apron, you can expect an unforgettable gastronomic experience unlike any other, with an ambience that is unmistakably Malaysian. The “Buy 1, 50% discount for 2nd Person” promotions from now until 10th May 2019. I must say that it is among one of the best I’ve tasted this year – flavourful and spicy, and you get to load it up with all the toppings your want! PARKROYAL Hotel Kuala Lumpur will be having a special Ramadan Promotion with the theme ‘Selera Istimewa Bonda’ starting from the 5th of May until the 4th of June 2019. The buffet will be offering a variety of traditional dishes specially prepared by the hotel’s chefs which will take you down memory lane, evoking nostalgia of your mother’s cooking and traditional recipes. These local highlight dishes are specially prepared by designated chefs from their respective states, where all ingredients are selected thoroughly to ensure the authenticity and originality of the local dish. For this Ramadan Special at Chatz Brasserie, diners can look forward to the hotel’s special take on ‘Malaysian Cuisine’ with a variety of Malay traditional flavours, live food stall stations with local food concepts and a truly authentic Kampong style local ambience which guests can truly experience the Malaysian culture at its finest. One of the highlights will be the Lok – Lok (Steamboat) where guests can choose a variety of ingredients of more than ten items alongside a special home-made sauce elevating this steamboat from the traditional Lok food truck on the streets. Other highly recommended dishes include the special ‘Ayam Pansuh’ which is diced and cooked in a bamboo stalk, Bubur Pedas which is normally eaten during Ramadan (the Chef’s signature specialty), Chef Stewart’s signature Kolo Mee, and Oxtail Asam Pedas. There will also be a made to order Teh Tarik trolley which will visit each table, providing diners an up close view of the Teh Tarik making process. 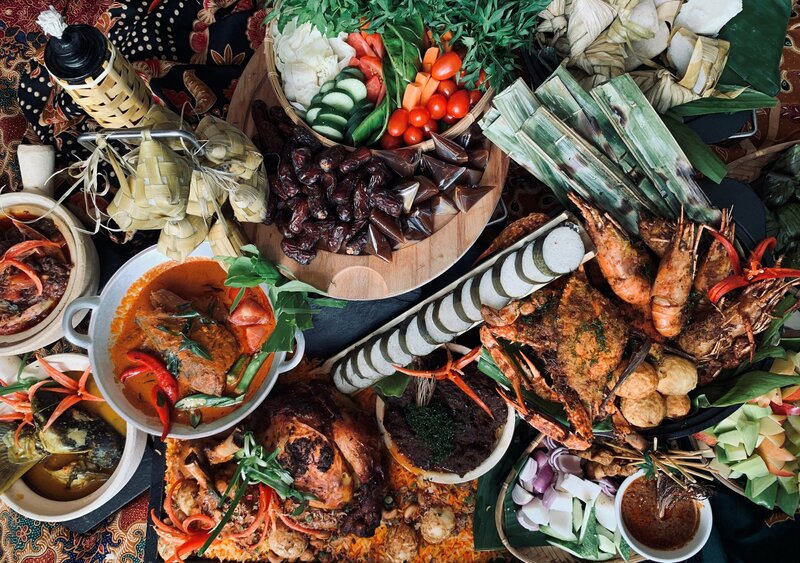 The Saujana Hotel Kuala Lumpur welcomes Ramadhan 2019 with an array of Iftar offerings at Charcoal during the upcoming holy month. The buffet dinner at Charcoal – the hotel’s all day dining restaurant, will be featuring over 180 mouth-watering specialties from Malay, Indian, Chinese, Indonesian, Italian, Japanese, Middle Eastern and more. Look out for some signature dishes such as the ‘Sup Gear Box’, ‘Kambing Golek’ (a slow-roasted whole marinated Lamb in Percik Spice), ‘Ayam Kampung Masak Merah Saujana’, ‘Gulai Ikan Yu dengan Daun Kesom’, ‘Ketam Masak Lada Hitam’, ‘Daging Masak Merah dengan Nenas’, ‘Sotong Goreng Rangup Masak Pedas’, ‘Kai Lan Goreng Ikan Masin Cili Padi’, ‘Udang Laut Goreng Butter Basah’, ‘Roasted Duck with Spicy Sauce’, ‘Ikan Patin Asam Tempoyak’, Daging Masak Hitam Charcoal, and more. The Seafood-on-ice section includes Poached Tiger Prawns, Flower Crabs and New Zealand Mussels, while if you’re a fan of traditional Nyonya dishes, Aunty Bel has an array of freshly prepared Nyonya dishes. I personally enjoyed the Baked Fresh Oysters with Orange Cheddar Cheese and Creamed Spinach, as well as the freshly shucked oysters. The kambing golek and rendang daging were also very delicious, and being someone who likes ikan masin, I was thrilled to find six (6) different types of ikan masin which were still crispy! Charcoal’s new creation this year is the Marinated Squid with Turmeric, while the Beef Striploin in Saffron and Cardamom, and the ‘Kerang dengan Air Asam’ are also highly recommended by the chefs. The restaurant has an open kitchen concept where you can witness the chefs creating the dishes at the live cooking stations which includes the Charcoal Nasi Lemak Telur Bungkus – comprising of Chef’s Flavour of Coconut Rice Sambal Ikan Bilis and Bawang, Sambal Ikan Sardin, Ayam Panggang Percik, ‘Goreng-Goreng’ stall, ‘Ulam-ulaman’, six types of ‘Jeruk’ on rotation, ‘Bubur Lambuk’ and sweets like Dodol, Buah Kurma, Tapai Pulut, Tapai Ubi and other Malay kuih muih, ‘Bubur Pulut Durian’, ‘Ice Kacang with Durian Paste’ and Western desserts such as Hazelnut Chocolate Cake, Black Forest Cake, followed by ‘Buah-buahan Tempatan’ and a ‘Kopitiam’ stall. The buffet is priced at RM162++ per adult while children between the ages of six and twelve years old can enjoy 50% discount (those below the age of 6 years old dine for free!). Maybank and CIMB cardholders, Lifestyle by Saujana and Saujana Golf and Country Club members will enjoy a 20% discount with T&C apply. Early bird discounts and Ramadhan Buffet Gift vouchers are also available. For in-house guests, in-room Sahur request is available with prior reservation. For larger groups wishing for a unique Iftar experience, the function rooms are available for groups of 40 or more, while the ballroom can be transformed into a ‘KampungKu’ atmosphere with special Batik runners and tiebacks filled with Pelita and Ketupat decoration, priced at RM165 nett per adult. New World Petaling Jaya Hotel has a special buffet this Ramadan period entitled “Santapan Warisan” with a lively market-style set-up at Pasar Baru. The hotel’s Executive Chef – Joshua Er, together with his master chefs have skillfully put together a buffet spread which feature over 100 mouth-watering dishes of local and traditional Malaysian delicacies. There’s a selection of imported seafood such as yabbies, bamboo clams and crabs and prawns. 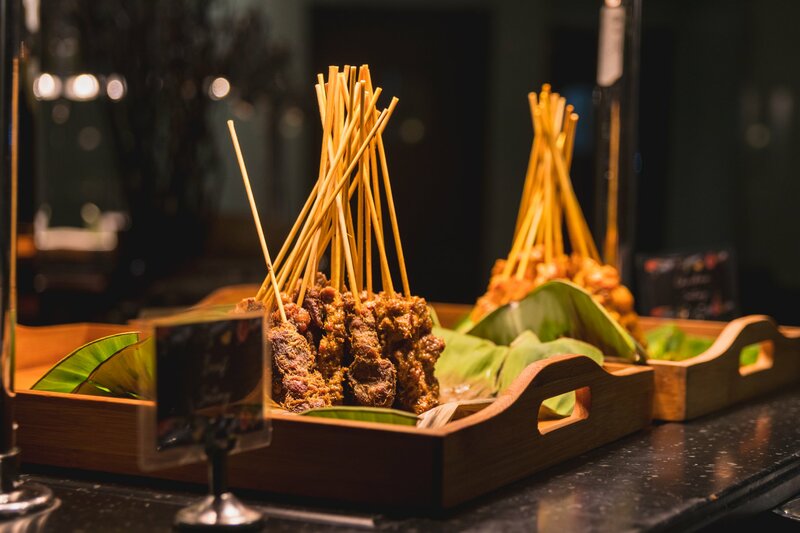 Then indulge in the traditionally prepared Malay dishes from the main buffet counter, including Pasar Baru’s signature made-to-order beef and chicken satay, freshly grilled seafood, and traditional ‘bubur lambuk’. Those looking for lighter and healthier options can toss their own ulam-ulam (mixed viands) or pick from a variety of ready-made salads on offer. A must-have is Pasar Baru’s roasted lamb, which is accompanied with a whole variety of sauces. For sweet tooths, there are many desserts including sago gula Melaka, blueberry cheese tarts, a selection of home-made Malay kuih, and you can even make your own sundae with soft-serve from the ice-cream machine. The various live-action stations will give diners a first-hand view of the preparation as the chefs prepare and serve the fare, from noodles noodle and lok-lok station to roti canai, murtabak, and even crepes at the dessert section. My personal favourite is the steamed chicken rice which is really tender and juicy. Have it with lots of ginger and the special garlic chili sauce! The curry noodles is pretty decent too and you can load it up with lots of ingredients! The “Santapan Warisan” buffet is available from 3 May to 31 May 2019, 6.30pm to 10.30pm and is priced at RM128 nett per adult and RM64 nett for children aged 5 to 11 years. Early Bird Deals are available from 1 April to 30 April 2019 priced at RM88nett (in the ballroom) or RM99nett (at Pasar Baru). One World Hotel Petaling Jaya’s concept of offering traditional flavours returns in its ‘Kembara Tujuh Sajian’ promotion at Cinnamon Coffee House this May. The buffet line-up once again spotlights time-tested kampung-styled dishes and local street fare. The buffet features six rotational menus with over 100 dishes daily. Executive Sous Chef Saiful Baharin recommends the Kari Ayam Kandar, Sambal Udang Petai, Kambing Semur Kerisik, Gulai Daging Tetel Kawah Tok, Asam Ikan Pedas, Perut Lembu Masak Cili Api and Sayur Pucuk Manis as the must try dishes. Desserts range from Western-styled sweets such as Coconut Choux, Apple Cinnamon Frangipane, Baked Lime Cheese Cake, Mango Panna Cotta, Raspberry Éclair, Pavlova to local ones like Assorted Kuih Muih, Agar Agar, Kek Kukus, Bubur Pengat Pisang, Ais Kacang and Pulut Serawa Durian. Kembara Tujuh Sajian at Cinnamon Coffee House is priced at RM148.00 nett per adult and RM78.00 nett per child aged 6 – 12 years from 24 Apr to 05 May, and RM175.00 nett and RM90.00 nett respectively from 06 May to 04 June 2019, from 6.30pm to 10.30pm. Reservations are encouraged to avoid disappointment. Sheraton will be having their “Hidangan Nostalgia” buka puasa buffet dinner in both Feast All Day Dining and the Grand Ballroom. The buffet in Feast runs from 6 May until 4 June 2019, priced at RM138nett per person, with an early bird rate of RM128. Meanwhile the buffet in the Grand Ballroom runs from 13 to 31 May 2019, priced of RM98nett person, with an early bird at RM88nett. Both venues will open its doors to the diners from 6:30PM to 10:30PM. Children of age 5 – 11 years old get a 50% discount off the selling price. There will be over 80 dishes including Ayam Percik, Nasi Biryani dengan Kambing Panggang, Gulai Tempoyak Ikan Patin, Lemang Pulut Hitam, Roti John, Sup Tulang Rawang, Ketam Lemak Cili Api, Gulai Ayam, Mee Kari Salmon, Pengat Durian and Aneka Goreng cekodok pisang, pisang, cempedak, keledek and keladi. Diners in the grand ballroom will be entertained by live music that plays melodic traditional tunes that eases the mind, body and soul throughout the course of dinner after a long day fasting and at work. For those who would like to perform prayers, both the male and female surau are located on the same floor as the grand ballroom and equipped with praying mats and telekung. During the month of Ramadhan, the hotel is also extending an exclusive rates for rooms and meeting spaces for those events that will kick in during this fasting month. A group booking of minimum 10 rooms and maximum 25 rooms, guest will be privileged to enjoy a rate that is only from RM280+ (room only), RM320+ (with breakfast or sahur). These rates are applicable for Deluxe and Executive Deluxe rooms only and an additional RM130+ should you wish to upgraded to Club rooms with club benefits. Supporting this group bookings, meeting spaces are also offered with special rates that starts from only RM180+ per person that includes full day meeting with supporting amenities and buka puasa dinner for those who are fasting. The rooms with meeting spaces promotion is valid until 16 June 2019, and will follow through with Raya Open House package that starts from RM100+ per person includes hall rental and basic raya theme decorations. The above list and info of buka puasa/ Ramadan buffets, dinners, and promotions 2019 in Kuala Lumpur, and Selangor is correct at the time of publishing. However, we do encourage you to check with the respective hotels’ website for any additional updates.